Bleach follows Ichigo Kurosaki, a dude with a sword fighting evil spirits. He has powers of the Soul Reaper (think Grim Reaper). 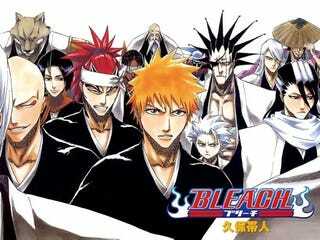 Bleach debuted as a manga in 2001 and has since been adapted into an anime. Hollywood has optioned Bleach for a feature film. Warner Bros. is developing the project, which will be produced by Peter Segal, Michael Ewing and Bleach's U.S. manga publisher Viz Media. Peter Segal and Michael Ewing are responsible for films like Get Smart, The Longest Yard remake and 50 First Dates. Yeah. The guys responsible for the film version of Get Smart, The Longest Yard remake and 50 First Dates. No word on whether this is live-action or animated, so everybody chill out and enjoy this Bleach opening. To date, there are nearly 20 video games based on Bleach, including DS fighting game Bleach: The Blade of Fate.